JERUSALEM (CNN) -- Seven people, including three girls, were killed and nearly 200 other people were injured when three nail-laden bombs rocked a pedestrian mall in downtown Jerusalem Thursday. The blasts were set off by three suicide bombers, who were among the dead. The other victims included three girls, aged 12, 14 and 15, and an unidentified man. A leaflet left at the scene claimed that the bombers were Islamic militants from the group Hamas and said more bombs would be set off if Israel does not free Palestinian prisoners it holds. In response to the bombing, the Israeli government reimposed a total closure on the West Bank and Gaza Strip, preventing Palestinians from entering Israel. An angry Israeli Prime Minister Benjamin Netanyahu laid blame for the attack at the feet of Palestinian Authority President Yasser Arafat. "Arafat personally hugs and kisses the Hamas leaders, and his security chief proclaims, as he did the other day, (that) we're all part of the same struggle," Netanyahu said. "What struggle? The struggle to blow up women and children and babies?" Shocked Palestinian officials vigorously condemned the attack and promised to work to undercut the bombers. "We are ready to cooperate with the Israeli authorities to find the persons who stand behind these operations, and we are ready for complete cooperation," said Palestinian cabinet secretary Ahmad Abdul Rahman. 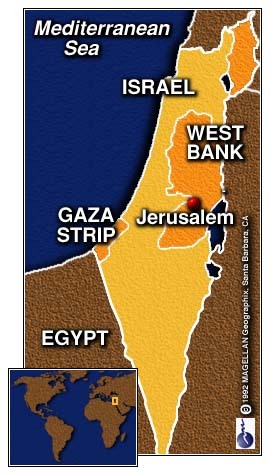 But the cabinet secretary said the Israeli decision to seal off the West Bank and Gaza "will not stop terrorism." "Peace will stop terrorism," he said. Hundreds of people were packed into the Ben Yehuda Street mall at about 3 p.m. local time (8 a.m. EDT) when the explosions went off, Israel radio reported. Palestinian Cabinet member Hanan Ashrawi: "Atmosphere of violence, instability ..."
Netanyahu adviser David Bar-Illan: "Mr. Arafat has decided to make peace with the terrorists ..."
"It literally destroyed the center of the mall," said Pierre Klochendler, a CNN producer at the scene. The blasts shattered windows, knocked over cafe chairs and ripped down awnings along the wide pedestrian walkway. Blood spattered the pavement and rescue workers rushed victims away on stretchers. Body parts were covered by sheets. A security guard, who identified himself only as Yaakov, said he saw "people fly through the air." Police sealed off the area shortly after the blast, fearing more explosions could go off. "I was standing near the Mashbir department store, and suddenly I heard two huge explosions," said shopper Etti Harel. "A cloud of black smoke went up to the top stories. It was awful." Israeli police believe the bombers set off their lethal charges -- consisting of two to three kilograms (about 5 pounds) of explosives -- within seconds of each other after making eye contact. One was disguised as an old man and another as a woman, police said. Police sources told CNN that the three bombs appeared to be less powerful than two bombs that rocked an open market in Jerusalem on July 30, killing 15 Israelis. The blasts came a week before U.S. Secretary of State Madeleine Albright was to visit the Middle East in hopes of putting the Israeli-Palestinian peace process back on track. Speaking in Prague, Czech Republic, where she is on a private vacation, Albright said her trip will proceed as scheduled because "we cannot give in to terror." Albright offered her "heartfelt prayers and sympathies" to Netanyahu by phone and called on Palestinian officials to do more to combat terrorism. "Fighting terror is a 24-hour-a-day job. Security cooperation must be accompanied by unilateral Palestinian action to pre-empt terror," Albright said. Late Thursday, Palestinian authorities detained two Hamas political leaders in the West Bank, arrested eight activists and shut down a Hamas newspaper in Gaza, Palestinian security sources said. But that fell far short of the crackdown Israel demands. Correspondent Jerrold Kessel and Reuters contributed to this report.